Welcome to another Foodie Friends Friday! I am so happy to be a part of this wonderful network of fellow foodies! It has been so wonderful getting to know them and see the wonderful foods they create. This week I am featuring Lois at Walking on Sunshine! Like me, she is a mother of two and she married a man she met in her teens. (I ended up married to the boy I had a major crush on in 8th grade) We both like to cook, clean and organize. My husband thinks I am crazy because of my love of organizing. :) I look forward to seeing more wonderful postings from Lois in the future! With tomato season just around the corner, I was immediately drawn to her recipe for Tomato Salad. Four simple ingredients keep the dish clean and allow you to enjoy the sweet taste of farm fresh tomatoes. I love how this simple side dish can be easily paired with a pasta, burgers, sandwiches, or anything else you might be serving. When you visit her page, check out the focaccia she makes with the left overs from this salad! This delicious pizza is jam-packed with veggies! It is one of my family's favorites for sure! There are so many textures and flavors combined to make this pizza a real delight for the whole family. The quality of the pesto is so important to this dish, so I truly hope you make your own. There are far more veggies than cheese, so it is a healthier option for a pizza. (Good since I LOVE pizza!) This is another recipe that allows you to prep the ingredients ahead of time, so your dinner-time rush is incredibly fast and simple. I hope you give this pizza a try! Heat the oven to 475 with the pizza stone already inside. Spread the pesto evenly on the pizza crust. Top with the vegetables and cheese. Bake directly on the pizza stone for 8-10 minutes, or until the cheese is lightly browned. Pesto is one of those foods that should never, EVER be purchased pre-made. I don't care how fresh it claims to be, it will never be as good as homemade! It only takes a few minutes and a few ingredients to whip up a batch for your dinner. It is so worth the extra time! I have been making this pesto for years. In fact, I didn't have a "recipe" for it, so I had to take my time and measure out the ingredients in order to post this recipe for you. I add less oil than I see in many other pesto recipes. I find it makes for a richer flavor. I use this recipe exactly for pesto pizzas, but sometimes I will add a little more oil if using in a pasta. That's what is great about making your own! You can customize it each time!! 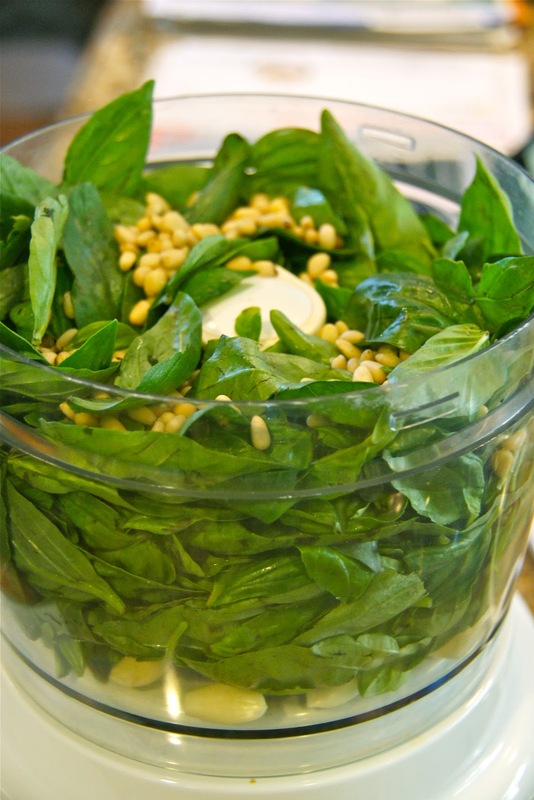 Once you try it, you will be like me and only have pesto when you can find fresh ingredients to make it yourself! Place the peeled garlic cloves into a food processor. Add the basil leaves and pine nuts on top. Pulse until coarsely chopped, scraping the sides as needed. With the machine running slowly add the olive oil until desired consistency is reached. Transfer pesto to a medium bowl. Stir in salt and parmesan cheese. Adjust salt and/or cheese until flavor is just right for you. Summer is upon us, and to me, that means berries!!! This week we picked up some blackberries at our local farm and I was so excited to try making a cobbler. We don't often have desserts other than fresh fruit, so this was a real treat. My hubby said it is one of the best desserts I have ever made! I even decided to make my first-ever batch of vanilla ice cream. What could be better?!? This cobbler was so wonderful. I'm sure it could easily be adapted to accommodate a wide variety of fresh berries you may have locally available to you. I was really shocked at how easy it was to prepare! I actually baked it while we were eating dinner so we were able to enjoy it fresh out of the oven for dessert. Give it a try. You will not be disappointed!! In a large bowl, combine flour, 1/2 C sugar, baking powder, and salt. Cut in butter until the mixture resembles coarse crumbs. Stir in boiling water until mixture is just evenly moist. In a separate bowl, dissolve the cornstarch in cold water. Mix in remaining 1 C sugar, lemon juice, and blackberries. Transfer to a skillet and bring to a boil, stirring frequently. Transfer berries into a baking dish (8x8 or individual ramekins). Drop dough on top of the berries by the spoonful. Bake for 25 minutes or until dough is golden brown. Serve warm with ice cream. I was finally able to go to both of my local farms this week and I loaded up! We purchased zucchini, sweet maui onion, green beans, corn, fresh garlic, basil, and strawberries. One of the farms also had a great selection of seasonal fruits brought in from an organic farm in Lodi, CA. From that selection we chose blackberries and yellow peaches. We even have some cucumber from our very own backyard! I love summer!! Here is what I have planned for this week.